After Florence, dozens of water and sewer system throughout North Carolina are struggling. Many have been struggling since Matthew, two years ago. Dozens more were underwater before either storm hit, with shrinking economies and populations that make it difficult for them to cover routine expenses and service the debt on their water and sewer infrastructure. As policymakers begin to shape the state’s rebuilding program in response to Hurricane Florence, they face challenges in dealing with the already distressed systems and those damaged in the most recent storm. They also face the difficulty of devising long-term solutions to a chronic statewide maintenance backlog. The damage to those systems and the floods that followed resulted in spills of tens of millions of gallons of wastewater and sewage. The systems in trouble because of the recent storms are not alone. This year, 43 municipal water systems, water and sewer systems or water authorities face severe financial distress, according to the state’s Local Government Commission, an oversight board put in place after widespread local government financial failures during the Great Depression. One of the commission’s main roles is to stop local governments from taking on debt they can’t repay. For towns prevented from taking on more debt and even those facing financial pressures for other reasons, deferring maintenance on water systems and dipping into revenue from public enterprises is a common practice that in recent years has drawn increasing scrutiny from the General Assembly. 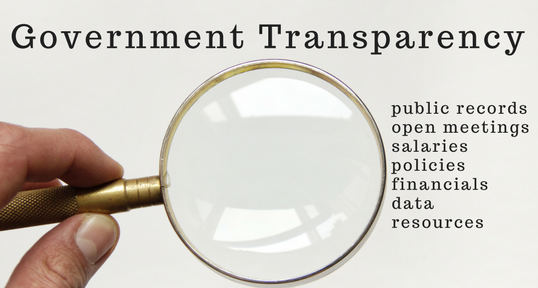 In 2016, the legislature set up a study committee on Rates and Transfers and Public Enterprises. Since its inception, the committee, co-chaired by Rep. Chuck McGrady, R-Henderson, and Sen. Paul Newton, R-Cabarrus, has moved from a broader look at water and sewer systems and enterprise funds to a more focused effort to develop policies and incentives to address the growing concerns about systems that are unable to sustain themselves. Both McGrady and Newton credit the treasurer’s office for urging the committee to take a hard look at a fix for struggling systems. Last year, the committee opted not to try and draft any legislation for the recent short session and is focused instead on targeted legislation in 2019, which is likely to include funding for more assessments of water and sewer systems and potentially state grants for needed fixes. At last month’s hearing, Starnes stressed that time is running short for many of the smaller municipal systems that have no workable long-term solutions. 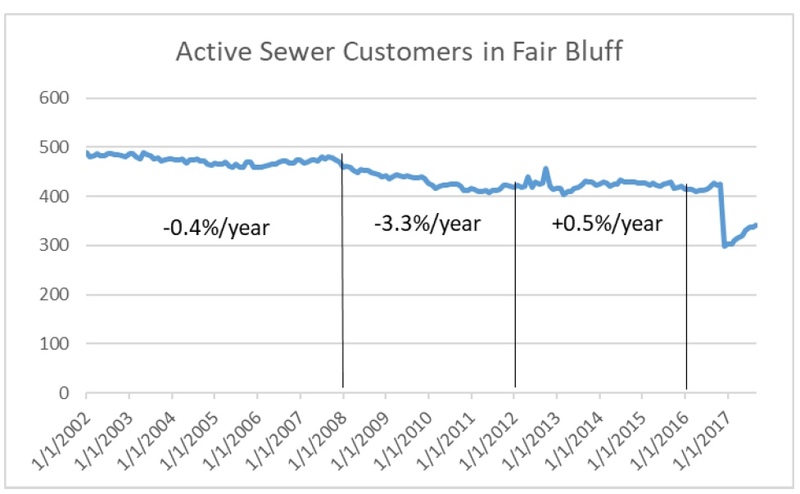 Chart shows the steady decline of the number of customers of the Fair Bluff water and sewer system followed by the sudden drop after Hurricane Matthew. Although the state’s list of financially distressed towns fluctuates, most communities on the list have been on it for years. Many of them have a similar story: They expanded their water and sewer systems decades ago to handle textile mills or other large customers. Once those plants shut down, the system costs didn’t go away, and towns faced with year after year of declining employment and aging populations struggled to keep up. Over the past year, a group formed by the Department of State Treasurer and the N.C. Department of Environmental Quality’s Division of Water Infrastructure has been working to come up with a plan to assist the systems that have little chance to ever catch up with maintenance backlogs and necessary upgrades. Kim Colson, DEQ Division of Water Infrastructure director who is helping lead the effort, said the decline of many of the systems is another symptom of the changes to rural North Carolina. At last month’s hearing, Colson told legislators that recent studies looking at customer density and the costs per customer of keeping up with repairs, new lines and other capital costs show how big the differences are between rural and urban systems. “In some of our rural communities, each individual customer is responsible for sometimes 10 times as much of a capital improvement budget as in the bigger urban areas where there’s a much higher density,” he said. That’s driving the effort, he said, to look at ways to get more water and sewer systems to share resources or look at mergers with larger, more financially stable systems. Colson said the division is considering a request for the legislature to set up a new grant program aimed directly at helping consolidations and mergers. 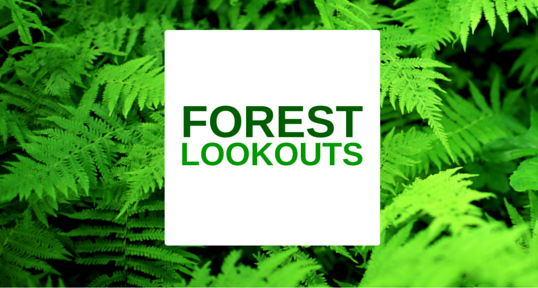 The grants would fund the costs of feasibility studies, pay for connections between systems and would be used to “reset” distressed systems ahead of a consolidation by covering the costs to catch up on deferred maintenance. Colson said the early estimate is that the program would require an initial investment from the state of $30 million to $50 million. Colson said a pilot program the state is trying to put together as an initial project would consolidate five troubled Eastern North Carolina systems, located in Columbus and Robeson counties, including the town of Fair Bluff, which was hit with heavy flooding last month after struggling for two years to recover from floods during Hurricane Matthew. The plan being considered would connect Fair Bluff, Boardman, Proctorville and Cerro Gordo with Fairmont, which has additional capacity in its sewage treatment plant. Without consolidation, the five towns were looking at widely different impacts in fixing and upgrading their sewer systems. Fairmont’s rates going forward for customers using 3,500 gallons per month would range between $57 and $64, while Cerro Gordo, where only 11 customers remain on the system, would have to charge $420 to $498. Under a consolidated system, using the Fairmont plant rates in all five towns would average $64. Going forward, if the consolidated system opts to connect with the even larger city of Lumberton system and not have to continue to maintain the Fairmont plant, rates would drop further. Now, after Florence, all five systems will have a difficult time “going it alone,” Colson said. If the state were to step in with a grant to help the systems reset and consolidate, he said, they would have a much better chance of being viable in the long run. Ultimately, connecting with the Lumberton system would also help by allowing the sewage treatment plant to operate at a level closer to what it was designed for, a problem at many plants in the state where major customers have pulled out. Colson said grouping smaller systems, similar to what’s being proposed in Columbus and Robeson counties, is one type of solution. One that’s probably more common, he said, would be for troubled suburban and rural systems to connect with larger urban systems. He said some of those connections have already been identified and could happen quickly once a grant program is in place. Jeffery Hughes, an associate professor at UNC Chapel Hill’s School of Government and director of the school’s Environmental Finance Center, said the state is trying to find a way forward in dealing with what for most communities is their most expensive public investment. Hughes said it’s important to remember that water systems have a lot of fixed costs that don’t vary much in the short term with how much service is being provided. Throughout the state, many of the communities facing funding challenges for their water systems are the same ones with challenges in other areas, like education and public health. He said places like Fair Bluff are examples of the difficulty some areas are faced with in trying to recover. But the state’s water system financing woes are not limited to those in the hurricane zone. Hughes, who has been working with the team from DEQ and the Treasurer’s Office to develop a proposal, said not all of them are rural systems as well. Some systems having financial difficulties are in the rings outside higher-growth areas that are having trouble keeping up with expansion needs. It might make sense for them to consolidate with a larger system, but the current system can be a barrier to that. Creating a way for them to purchase capacity in an existing system makes a lot more sense than building a new plant, but in cases where it makes sense for a larger system to take over a smaller distressed neighbor, there has to be some incentive, some way to make sure the larger system is kept whole. Hughes said another challenge is that in North Carolina, where there are dozens of isolated systems, it may not always be feasible for systems to connect water or wastewater systems. In that circumstance, he said, systems could still combine by consolidating administrative functions and maintenance to control costs. Scott Mooneyham, director of public affairs for the N.C. League of Municipalities, said setting up incentives will be important to finding solutions. Without it, Mooneyham said, consolidation will drive up water and sewer rates for everyone and put a further burden on local economies. Starnes, legislative liaison for the N.C. Department of State Treasurer, said the state is trying to find a path forward through incentives, but in some cases may have to step in if there’s no other option. The consequences, he said, could extend to more than just water and sewer. One idea DEQ is looking at, Starnes said, is asking the legislature to create a new type of town charter. That would allow some communities a route out of their financial bind without fully unincorporating, he said. The town would be able to keep its borders, which would be used to create an overlay tax district under the county to provide it with some source of revenue. The county would collect the taxes and pass the revenue on to the town, which could continue to maintain some services and amenities and to elect its own mayor and council. “We know some of these towns struggling with financial issues year after year anyway just can’t operate under the traditional definition of a town, but we want to give them an ability to maintain themselves as a town,” Starnes said. McGrady said the idea was interesting and worth pursuing. “It might make sense, not just related to water and sewer, but in a range of other things, population changes and whatnot, that might occur,” he said. Starnes said the Local Government Commission doesn’t want to force the idea on any community. For any new option to be successful there has to be agreement at the local level, Mooneyham said. “It should also be apparent that any changes in municipal structure or service functions need to be voluntary to be widely embraced,” he said.